LEXINGTON, Ky. (October 23, 2018) – The Breeders’ Cup announced new and exciting wagers that are sure to test the skills of handicappers across the globe for the upcoming Breeders’ Cup World Championships at Churchill Downs on Nov. 2-3. The new additions are highlighted by a late Pick 5 wager on Friday and Saturday, as well as the popular Jackpot Super High 5, along with Head2Head wagering and daily double wagering linking Friday and Saturday races. The complete Breeders’ Cup wagering menu and official race order for the 2018 World Championships will be announced today, Wednesday, Oct. 24. Multi-million-dollar betting pools are nothing new to the Breeders’ Cup but the introduction of a late Pick 5 on both Friday and Saturday figure to take things to a new level. The bet has quickly turned into arguably the most popular wager in the country on a day-in, day-out basis, due in large part to the extremely player-friendly 15% takeout and $.50-cent minimum wager, which the Breeders’ Cup will use as well. Couple that, along with the freshness of the wager, and the fact it will solely encompass Breeders’ Cup races, and the pools could swell to several million dollars. Among the featured new wagers to an already blockbuster menu of multi-race bets with million dollar guarantees, is the Friday late Pick 5, dubbed the “Future Stars Friday Pick 5,” which will group all five Breeders’ Cup Juvenile races, exclusively for 2-year-olds, while Saturday, the late Pick 5 figures to be wildly successful as it will culminate with the $6 million Breeders’ Cup Classic (G1). In addition, should any of the three preceding Pick 5s which includes the early Pick 5 on Friday and the traditional Breeders’ Cup early Pick 5 Saturday, not have a winner, that carryover pool will be added to the Saturday late Pick 5. The Jackpot Super High 5 requires bettors to pick the first five finishers of a race in order, with a $.50-cent minimum wager and 15% takeout. The wager will be offered on every race on the Friday and Saturday cards, including the undercard races, with the exception of the Saturday finale (there will be one race after the Classic). The payouts for the wager vary, depending on how many winning wagers there are. Should there be multiple winning wagers, then 75% of the pool will be paid out, with the remaining 25% of the pool carrying over to the next Jackpot Super Hi 5 race. Should there be one single winning .50 wager, then 100% of the pool will be paid to the winner. If the bet goes unhit and there are no winning tickets, therefore creating a carryover pool, then 100% of the net pool will move on to the next race. 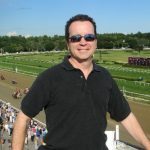 Should there be no single winning $0.50 wager in the Friday finale, the jackpot will carryover to the first race on Saturday, and, regardless of the carryover entering the Classic, will be paid out. With an extreme degree of difficulty to the wager, especially in full fields of 14 (or 12 in the new Juvenile Turf Sprint) with numerous winning contenders, let alone live longshots who could run in the top 5, a carryover pool is extremely likely to occur at some point during the two days. And with a carryover pool comes added interest to the wager, and more betting dollars, which can and will create a snowball effect as Friday turns into Saturday and the Classic nears. As with the two new Pick 5s created, bettors can expect the pools to be robust, and millions could be on the line should a carryover occur into the Classic, or if there are no single winning tickets throughout the day and the pool repeatedly gets funded by an additional 25% with each added race. Head2Head wagering is not unfamiliar to fans of the Breeders’ Cup and will be back this year, with three to be determined offerings Friday and four Saturday. The $10 minimum wager should appeal to a wide audience, as it offers just a 10% takeout and figures to include matchups that have a theoretical 50/50 chance against each other. An example of a head-to-head wager could be the Europeans vs. Americans in the Breeders’ Cup Juvenile Turf, as well as possible individual matchups in other races. Fans of sports wagering could especially be enticed by these wagers, as they will essentially be offered as an even-money proposition, yet with no point spread involved. The Breeders’ Cup will once again offer special Daily Double wagering that links a Friday race to a Saturday race, with a $1 minimum. While the Friday late Pick 5 is titled the “Future Stars Friday Pick 5,” the special daily doubles link the future to the present, as they will offer wagering on the Sentient Jet Breeders’ Cup Juvenile into the Classic, the Tito’s Handmade Vodka Breeders’ Cup Juvenile Fillies (G1) into the Longines Breeders’ Cup Distaff (G1), and the Breeders’ Cup Juvenile Turf (G1) into the Longines Breeders’ Cup Turf. The Breeders’ Cup has a longstanding history of not only offering the best equine and human stars to fans and bettors alike, but also the Thoroughbred racing’s best wagering menu of its kind, and this year’s added enhancements to the slate should only provide further proof of that.